I’m not quite sure what I was expecting when I got into Staxel, but what I did get kind of confused me and was a lot of fun at the same time. 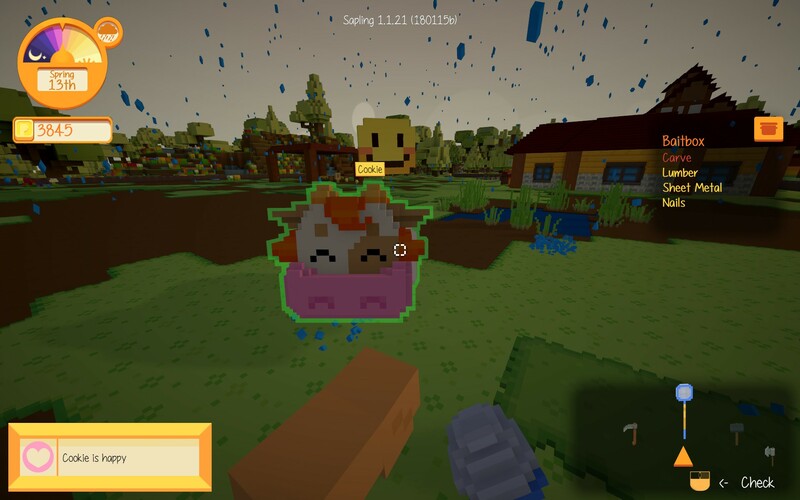 Staxel seems to be a mixture of Minecraft and Animal Crossing. 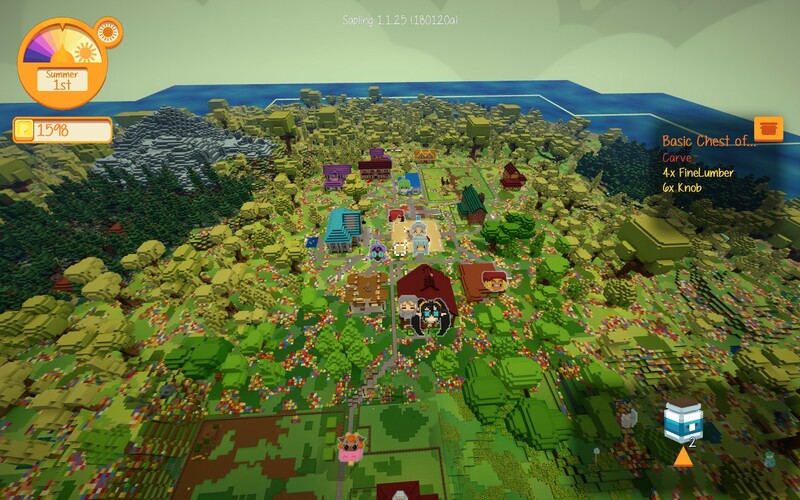 Reading what you just did may make you want to jump right in and start building and doing all sorts of crazy stuff because the game looks rather kind and the village you start out in seems like a happy place to live. That may not be what you experience in-game though. Life on the farm is tough… or at least as tough as you make it on yourself. Should you up and buy the farm? Let me break it down for you. Staxel is easy to navigate around because you’re basically stuck on an island. You can build on the water, but it doesn’t seem to be worth going a few minutes out… it’s lonely in the water. Who’s a good cow? Cookie’s a good cow! I’m planning on trying cows again and now on my 2nd playthrough, but I can’t build or purchase troughs which you need if you’re going to finish the farm building “quest”. If it’s not one thing, it’s another. Aside from the Steam Workshop, it seems the only way to grow trees back is to plant fruit trees only to cut them down when they finish growing… which would be horrifically expensive. Go get a mod. There are plenty of flowers though. However, I don’t think they grow back either. Crafting is interesting to say the least. There seems to be a ton of stuff to make and build. You can’t craft everything in the beginning, but they sell recipes at various shops. They don’t tend to change too much for me, but I’m hoping that gets changed later unless their focus is on requiring you to need the marketplace in town where they sell premade items. I can understand that, but I’d like to be able to craft anything I want at any time at my house. That aside, you won’t be able to put all of the crafting benches in your current house. There’s a separate bench for everything. They have a stations for chopping, baking, boiling, frying, mixing, sawing, combining, tiling, carving, constructing, assembly and a few others, but I think that makes my point. Everything is separated and while it does kind of make things a little more obvious on which tool to use, it does complicate things as well. On the plus side, you’ll get to make that kitchen of your dreams legitimately. Side note: I haven’t seen a recipe or the ability to buy a sawing machine and taking the one in town closes the store it’s in. So keep your klepto self in check and just let it stay for now. 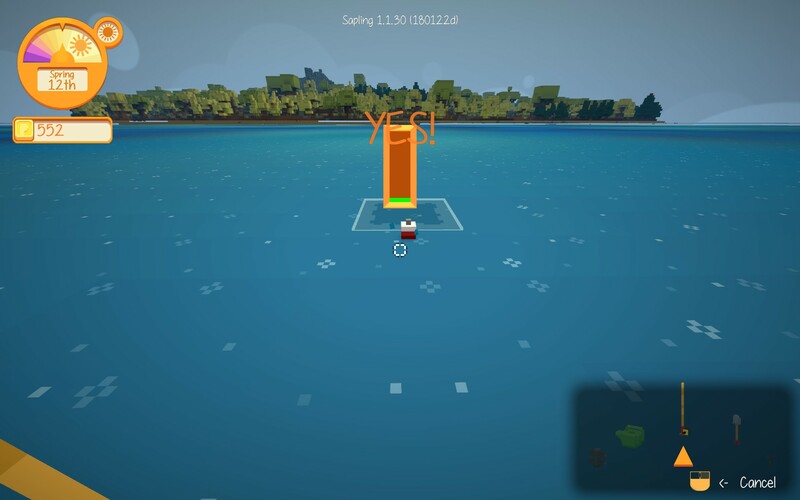 Fishing is a mini-game and it’s a nice approach. Also, yes I’m fishing in the middle of the ocean. I don’t want to go too much longer. Staxel, as it stands, is rather good in concept and definitely not a bare-bones game at this point in development. (I almost have 20 hours mucking around here.) 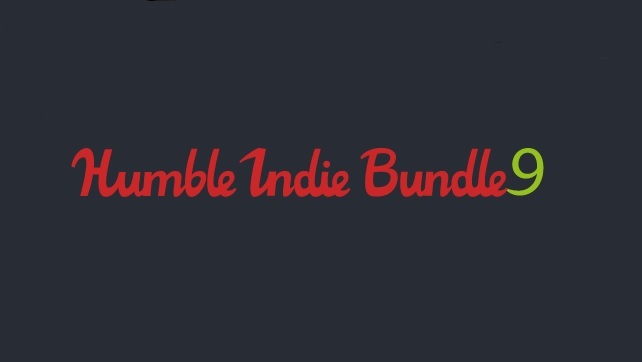 There still is some work left to do, but that’s always the case with games in Early Access. They recently added mines and that’s neat looking, but there’s nothing much to do other than enjoy the beauty of them. There are a few points of contention, but it looks like they are actively working on the game and I’m expecting it to be continually fleshed out. In the recent patches, the loading times have been significantly reduced which is awesome! 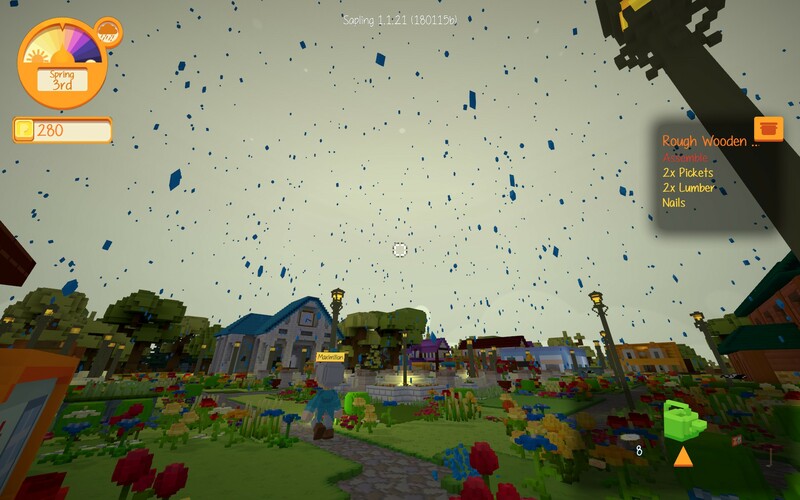 I wouldn’t go into Staxel expecting the world, but if you go into it thinking “resource management/building/life sim with a 1st person view”, I think you’ll be fine. The worst thing that’s happened to me was my dog hating me. Everything else can be managed better by planning ahead and not just plopping down animals because buttons need to be pressed. Need some easy advice? Go catch some bugs and sell them for money. There’s always plenty of them.